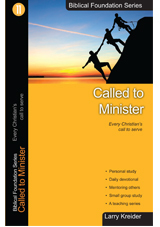 In this eleventh Biblical Foundation book, Called to Minister, we discover that every Christian is called by God to minister to other people. The Lord has called pastors and other spiritual leaders to train the saints so that every believer can be involved in ministry and become mature in Christ. As each believer fulfills what the Lord has called him to do, a wonderful thing happens. God begins to build His church through His people from house to house and in each community. Ministry does not just happen in our church meetings; it happens at our schools, our places of work, and in our homes as we reach out to others. Personal Study Read as an individual study program to develop spiritual maturity. Daily Devotional Each book has one month’s worth of daily readings, including questions. Mentoring Questions and life applications discussed as a one-on-one discipling tool. Small Group Study Each chapter has a teaching outline and questions for discussion. Biblical Foundation Course Can be taught individually or as part of the 12-book Biblical Foundation Series. Order the complete Biblical Foundation Series and SAVE here! The Biblical Foundation Series is available in English, Spanish and French!